kinda, sorta, what we expected? Well, we expected a hard-fought game dominated by the defenses, but I’m not sure anyone expected LSU’s offense, which had helped the team score 53, 41, and 42 in its last three games (each against SEC opponents), to simply liquefy under the heat of Nick Saban’s defense. If there was a decisive factor in the game, it’s arguable that it was the ineptness of LSU’s offense more than anything else. But Alabama’s defense surely deserves a lot of credit — LSU’s offensive line was whipped for nearly the entire game, and the issues with quarterback Jordan Jefferson’s play are well documented. 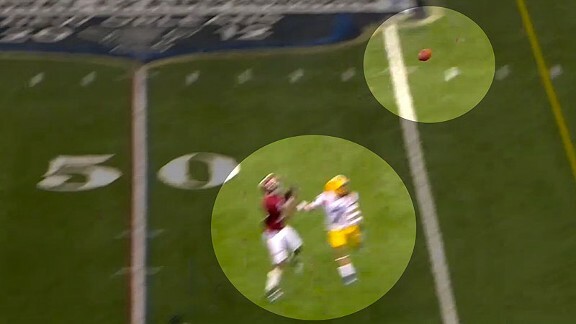 And, on the other side of the ball, LSU’s defense did play a commendable game under difficult circumstances, shutting down Alabama’s run game until late despite being constantly on the field thanks to their offense’s total futility. Yet Alabama quarterback A.J. McCarron was able to do what Jordan Jefferson couldn’t, which was to be efficient: He managed the game, completed a lot of passes to his tight ends, and, even without his best receiver, Marquis Maze, completed passes down the field against LSU’s vaunted secondary. Early on their first play in the third quarter, leading 9-0, Alabama and its offensive coordinator, Jim McElwain, immediately went on the offensive. They lined up with two tight ends to the right with Trent Richardson in the backfield, a strong running formation for them. 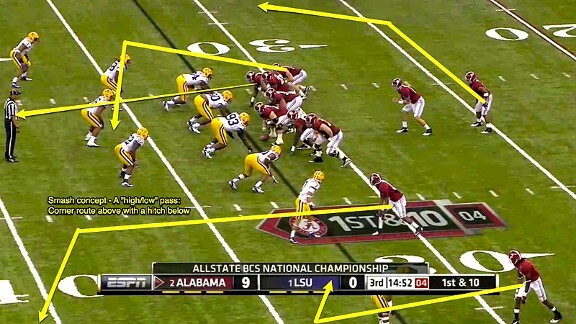 Wide receiver Darius Hanks lined up in the left slot, with Tyrann Mathieu matched up with him in man coverage. McElwain called for the smash concept to the left, which required Hanks to beat Mathieu, a Heisman finalist. As the play develops, Hanks releases clean off the line and with outside leverage. Many times LSU’s defensive backs lined up inside to take away the easier throws for the quarterback, like quick slants and crossing routes. And defensive backs like Mo Claiborne, a possible top five NFL draft pick in a few months, are good enough to take away the inside leverage and recover to defend the outside throws. But Alabama targeted Mathieu, who is maybe the best raw playmaker I’ve seen on defense in some time but who, owing to his small stature and build, can have issues in man-to-man coverage. We can see that here as Mathieu’s beaten on the corner route, and, as he is out of position, doesn’t have the size to recover to the ball as it descends on Hanks. 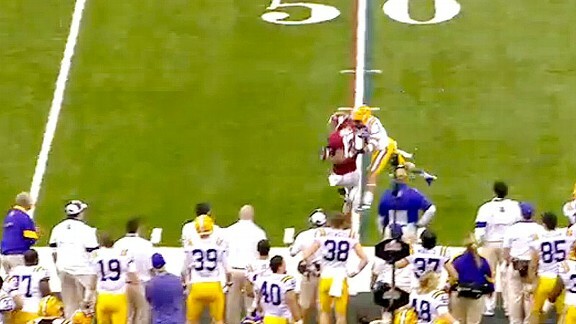 McCarron has put the ball in good position for his receiver, and it is Hanks’ job to go and get it. We can see that disparity very clearly in the image above, as Hanks actually turns his body back to the ball to catch it at its highest point, while Mathieu, trailing on the route — in the terminology of Nick Saban, a former defensive backs coach for Bill Belichick, Mathieu is “out of phase” — can only play the man. But he’s not able to, as the ball is thrown too well and Hanks gets too high for it, and Hanks is able to not only corral the ball but get his feet down as well. The drive would result in — what else? — a field goal for Alabama. 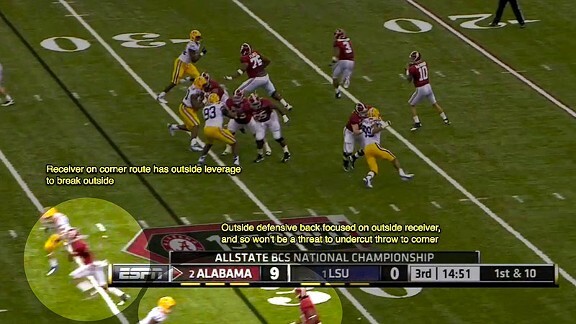 But in this game, given LSU’s offense and the dominance of Alabama’s defense, it was surely enough.